My favourite genre of adult fiction is what is coined ‘chick lit’. 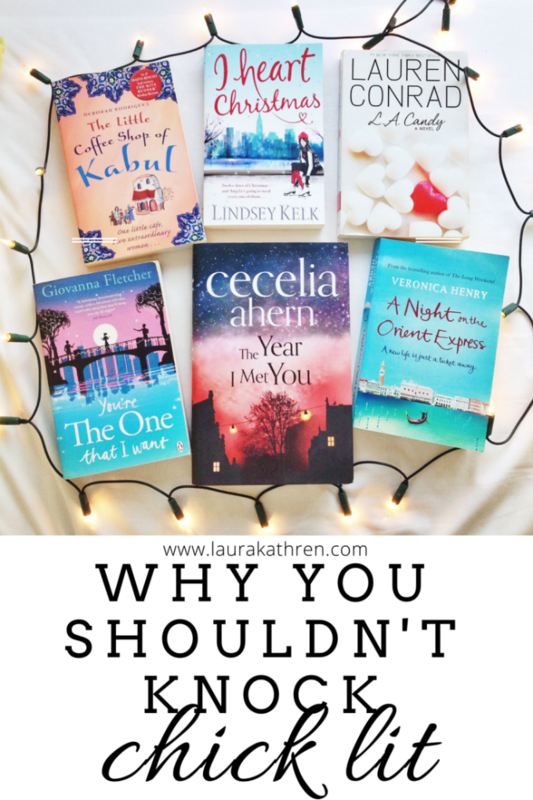 I’ve spoken about my love for Lindsey Kelk, Veronica Henry and Giovanna Fletcher before. However despite the raft of admirers this genre of fiction is constantly battered with criticism. For example, when the famous job interview question of ‘what book did you last read’ crops up I always find myself scrambling around for something remotely intellectual instead of the piles of amazing chick lit that’s actually sitting on my bookshelf. (I once panicked when remembering the last book I read was ‘50 Shades of Grey’ but that is entirely another story...) The usual reaction to ‘I read Chick Lit books’ is ‘why don’t you read a real book?’; the reaction to which you are sure as hell going to get some sort of disdained look from me. Undoubtedly, chick lit is viewed as the reality TV or trashy series of the book world. I’m not going to try and disprove that. In some ways, it is the reality TV of the book world but that doesn’t mean it is any less credible. Good chick lit authors have the ability to create the same addiction to the characters that the producers of ‘Made in Chelsea’ for example possess. Chick lit also provides the same opportunity to sit back, rewind and let your mind rest for a little as some of your favourite trashy TV does. There is a very good reason why such shows exist and in fact are immensely popular. When I sit down to read a book, the vast majority of the time I don’t want to have to sit there and puzzle out what the writer is trying to convey to me. For example, I have had Samantha Shannon’s ‘The Bone Season’ sitting on my book shelf for about two years now; untouched and never read. The reason being, that when I open the book I was basically faced with a map and a glossary-come-family tree of all the different types of fantasy person in the entire book. I found myself, only a couple of pages in, constantly referring back to the glossary to work out what on earth she was talking about and as such, losing track of what I’d actually just read. On a side note; I do however imagine it is a very good book when you get into it and it has had amazing reviews – it’s just a shame I can’t find the desire to work my way through that wall. I don’t really want to have to plough my way through heavy laden fiction nor do I particularly want to stretch my brain any when I pick up a book the vast majority of the time. I simply want to disappear off and enjoy some easy reading. I also study a very literature intensive degree. When I’m finally done reading screeds of monotonous non-fiction, pages of Latin-laden old reads and legal cases up to my eye-balls, quite frankly the last thing I want to do is read a particularly taxing book. That is why I turn to the Chick Lit. My good ol’ friend Wikipedia defines Chick lit as ‘genre fiction which addresses issues of modern womanhood, often humorously and light-heartedly’. Chick lit is the same type of genre that I enjoy across a range of outlets. I enjoy magazines which address issues of modern womanhood, I also enjoy light-hearted blogs. Chick Lit often surrounds incredibly relatable characters – one of the most famous being the much-loved 'Bridget Jones'. Chick lit provides a happy escape from the day-to-day and usually one where I can dive in straight away with very little fuss or puzzling. One of the other main criticisms of this genre is that there is always an unrealistic happy ending, and in most cases I tend to agree. But again, what is so wrong with a happy ending when the vast majority of real life these days is about communicating stories of sorrow. What’s wrong with indulging in a bit of positivity at the end of a long day? This use of a happy ending is also emphatically a writing technique that is used across many mediums. A sad ending usually leaves the audience feeling unfulfilled and subdued but a happy ending can leave the audience with a sense of closure and uplift. It really depends on the way you wish your audience to feel at the climax of your story, not on the genre your story necessarily falls into. This ‘unrealistic’ happy ending is also a flawed criticism in the sense that you rarely see science-fiction or fantasy novels criticised in the same way, that their story is unrealistic. Of course it is. It is therefore obvious that some critics of chick lit forget that this genre is largely non-fiction and therefore simply a story. However dear blog reader, I’m not saying that all chick lit is good. Far from it; there are, admittedly, some terrible chick lit books the same way as there are some terrible books from other genres. My main gripe being that sometimes chick lit can be horrendously cringey, and as someone very British these examples can sometimes make me squirm. However, when a chick lit book is well-written it is of no less importance than other literary works to those that enjoy it. And those who criticise, but never indulge, would be as well to give it a try. So the next time I’m asked ‘which book did you last read?’, I’m going to proudly announce my latest friend-feud and love laden chick lit champion and explain just exactly why I think it’s pretty darn fantastic. And to those literary snobs, perhaps next time instead of turning your nose up, just say it’s not quite your cup of tea and tell me exactly what is. I’m all ears. Do you like chick lit? What do you think of the genre?